Click on an image above for a larger picture. 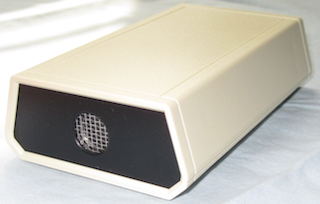 The GM-10 contains a geiger mueller tube, capable of detecting alpha, beta, and gamma / x-ray radiation. Each time a radiation particle enters the sensing window, it is detected, and the software on the attached computer is informed of this event. By adding up the number of detections per minute, the Counts Per Minute (CPM) is calculated and displayed. This number is a relative indicator of the amount of radiation present. Two versions of the GM-10 are available. One includes a USB adapter and plugs in to a USB port on your computer (Windows, Macintosh or Linux), and includes a 6 ft long USB cable. 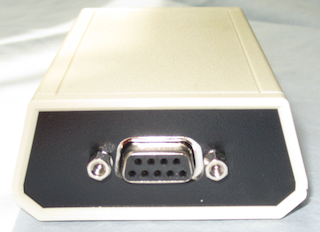 The other version plugs into a standard RS-232 serial port on your computer, and comes with a cable for the standard 9 pin PC serial port. Since the GM-10 is self powered by the computer's serial port, no batteries or external power adapters are needed! You can operate them anywhere you can take your computer or laptop! 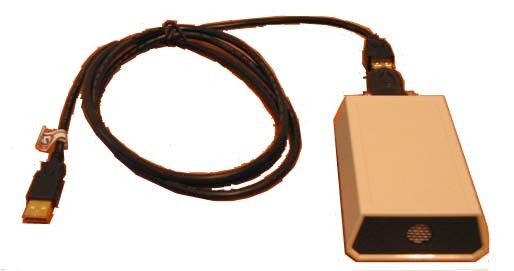 The GM-10 can also be connected to a microcontroller, or other embedded computer system for OEM use. Please feel free to contact us with any questions you may have. Due to various sources of radiation, both man-made (fallout from nuclear testing in the 1950's and 1960's) and natural (such as radon, cosmic rays, and the like), there is always some background radiation present. This background radiation level varies, depending on your location, and even the local weather. There are also short term statistical variations. This means that the CPM will vary over a short period of time, centered over what can be considered the actual average value. The RS-232 version of the GM-10 is just $249, and the USB version is $299. Volume and academic pricing available, please contact us at info@blackcatsystems.com for details. Included with your geiger counter radiation detector is a copy of our Rad software for reading and storing data, as well as creating graphs and analyzing trends. Please note that this product is not weatherproof, and is only for inside use or temporary outside use. Thinking of buying a surplus CDV-700 or 715 detector? Be sure to read our report first.